Bradley Beach employees and some volunteers take care of the plants and flowers in the greenhouse which are then planted throughout the borough in the spring. Coaster photo. With just nine full time employees, including two working supervisors and one foreman, the Bradley Beach Public Works Department is a force to be reckoned with. Despite a winter of more than a dozen snowstorms, the Public Works department is revving up for the summer months, making sure Bradley Beach is functional and beautiful for residents and visitors. Out in the parking lot sits the brand new street sweeper, retailed at $189,000. The department was able to trade in their 14 year-old sweeper for $40,000, making the net cost of the sweeper $149,000. Next to the sweeper, sits a few trucks, some over 20 years old, but still in great condition. “We take care of our equipment,” said Councilman Sal Galassetti. Inside, they’re working on fixing up the lockers from the beachfront. The boxes hadn’t been fixed for almost five years and were rotting inside and the hinges were rusted. This year, the borough has added 10 additional boxes that residents can rent for $125 per box that will be outfitted with stainless steel hinges and ALAC plastic. The beach lockers bring in $36,000 in revenue for the town. Also inside is the new interlocking Mobimats made of PVC for the beachfront that will begin to replace the rolled mats that have continued to fray along the edges. These new mats lay flat and are made of hard PVC plastic. This year, the borough purchased 50 for $30,000 and plans to buy a few more each year. 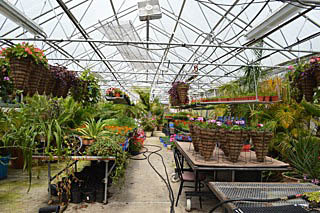 The department also houses the town’s greenhouse, one of the only towns along the Jersey Shore (Spring Lake also has a greenhouse) to grow and save their own plants and flowers. Tucked away behind the Department of Public Works and Recreation buildings stands the greenhouse alongside the railroad tracks. Built with a grant and fundraising money just after September 11, 2001, the greenhouse contains thousands of plants that are planted throughout the borough. The building features an automated sprinkler and climate control system and houses the borough’s palm trees and enough flowers to fill the 67 flowerbeds in town. Galassetti has unofficially taken over the operation. He has involved the community as well, bringing in school kids to help plant 30,000 seasonal plant plugs in flats over a few weekends in February and March. The plants have since grown from small plugs to flowering petunias and geraniums. “My grandfather was a master gardener,” said Galassetti as he names every plant in the greenhouse with pride. “It used to cost us $20,000 to plant, now it’s only about $5,000.” Residents can look forward to the end of May when they will be able to enjoy the flowers throughout the borough.